1- What is your Current Favourite Knife in your collection & why. 2- Plain Edge or Part Serrated? Its my No.1 knife because I.M.O. its the only one I would feel confident about using it for anything & it coming back in one peice, I think it looks good to. I prefer a plain edge, I feel it has more uses & its easier to maintain. My elk ridge skinning knife because its gorgeous. The 'Puma White Hunter' is my fav'. The small serrated section is ideal for cutting through really tough stuff. had been neglected a bit over the years. @Lone Wolf, a very elegant blade, I've yet to see a bad looking Elk Ridge. @Moon, I've never see a knife like that before, very unique looking, any chance of a close up of the serrations? @Larnz & Mick, awesome Bowies, love the coffin handle on the Laredo & the Outback has that Mick Dundee factor, amazingly enough someone actually broke there Outback Bowie, never thought I'd see that. 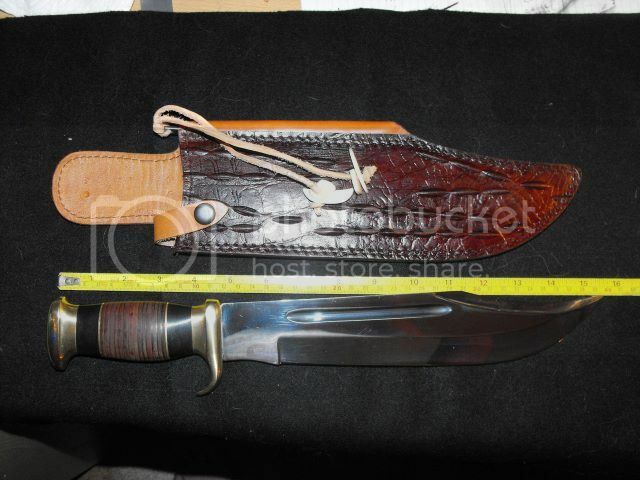 liquidator96 wrote: @Moon, I've never see a knife like that before, very unique looking, any chance of a close up of the serrations? Never seen one before Martin? I'm very surprised mate. The PUMA® White Hunter knife is handmade in Solingen, Germany, and has long set the standard for the ultimate hunting knife. The PUMA White Hunter was developed in 1956 in conjunction with the East African Professional Hunter’s Association to be the leading knife for big game hunting. I'm afraid that my camera skills are almost non-existant regarding close ups and that section of the blade is not what we know as serrated, it's more like a coarse hacksaw really, there's loads of pics on google. Have a look for the Linder White Horse too which is a blatant rip-off of the Puma and about 80% cheaper. This is the biggest knife I have with a 10" blade, completely useless for anything practical and one of the reasons why I'm not a great fan of large knives. Wow! Now that's an expensive knife, but from what I"ve read an incredible blade, custom steel & lasts forever seemingly, one reviewer has had his for 30+ years & its still going strong. I see what you mean about the 'serrations' very different to 'normal' serrations, good jimping on the top of the blade as well. Your spot on about the Linder being a cheap clone, you have a good 'un with the Puma. Got it on the nail Mick, the guy must have purposefully tried to destroy it, no one ot there right mind would use a knife, even one that good, to do those tasks with it, it's still on my 'Wants' list, as soon as the Mrs saw a pic, she decided she wants one as well! Crocodile dundee you say......how much is it and where can I buy one? I didn't pay the UK retail price for mine, I got it from a store in Berlin many moons ago for less than half of what they cost here at the time, still got the box and the 'Zertifikat' too but as much as I love it, I wouldn't pay the current silly price for a new one. I bought this William Rodgers with 8" blade, brand spanking new for £4 over 45 years ago, they're still made today under a different company name which I can't link to as they sell blades, I sanded the stag handle down as it was very rough and would give a gorilla blisters after 10 minutes of hacking saplings etc, it's carbon steel which is very easy to sharpen and even easier to stain and rust. I've used it quite a lot Mick, the blade has tiny scratches over it right now but they'll come out with a little polishing compound and a lot of elbow grease, they don't come with a highly polished mirror finish and it'll only get scuffed again anyway. There weren't many knives in the UK not made in Sheffield years ago Mick - Geronimo the famous Apache Indian chief carried one made by George Wolstenholm who had offices in New York and San Francisco at one time in the mid to late 19th century when there was a huge export market for knives made in Sheffield and Solingen which is in Germany, as you know. 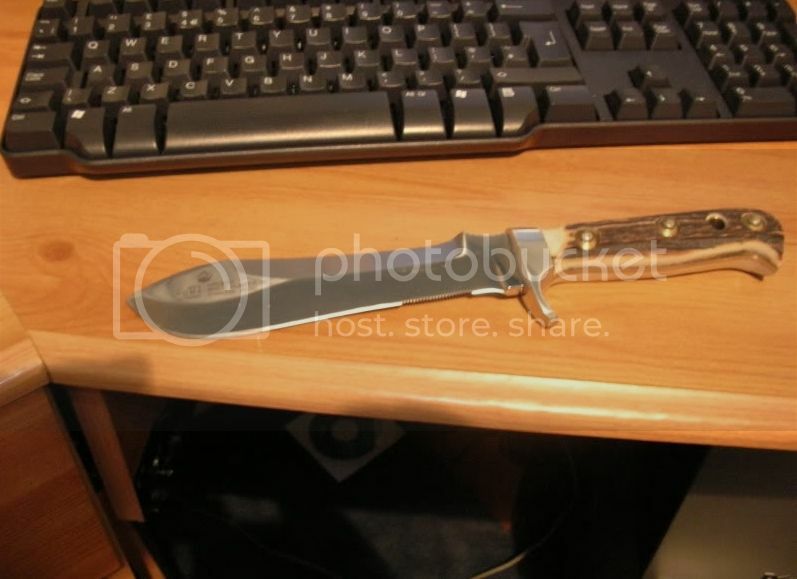 The knife in the pic above is exactly the same as mine, 11 6375 is the Model # and 104 means that it was made in the first half of 2004, there'll be a tiny indent on the opposite 'cheek' from the Rockwell hardness test.